Where do I begin? Sorry for not posting for a while as we were filming for another epic HSD show at the Mexican Shootout 2010. 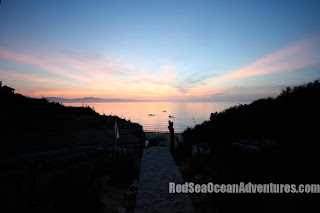 Every morning was just like this...wake up from our air conditioned casita to perfect sheet glass with the most amazing sunrises in the world. Our host of generous sponsors included: Blue Tuna spearfishing, Crows Creations Gaji Lures, Hawaiian Host Chocolates, Hammerhead Spearguns, Hanapaa Hawaii, Hawaii Skin Diver, Kawabanga Custom Spears, Noh's Foods of Hawaii, Pacific Island Music Distribution, Palapas Ventana, Red Sea Ocean Adventures, Riffe International, Sea Sniper, Speargear shop, Sonny Tanabe, and Volcom who donated so many prizes for our divers and boat men. 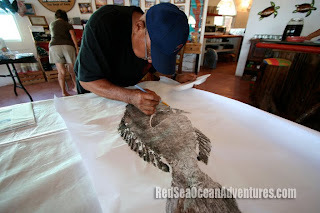 Gyotaku Artist "Crow" also flew over to provide our divers fish prints of their catches and even colored it on location. Everyone was amazed at the process and quality of his work. Of course our boatmen are the best! 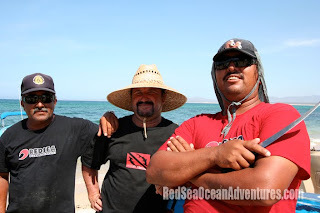 Nono (left), Asvaldo (middle), and Beto (right) were some of the guys who put our divers on the spot. They can spot a marlin a mile away and know each spot without a gps. 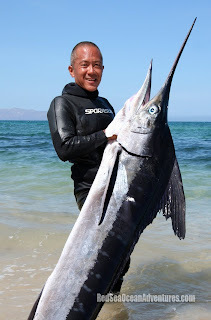 I've seen so many Ono's here in mexico in the 30-50 lb range and ton's of mahi that blew me away. 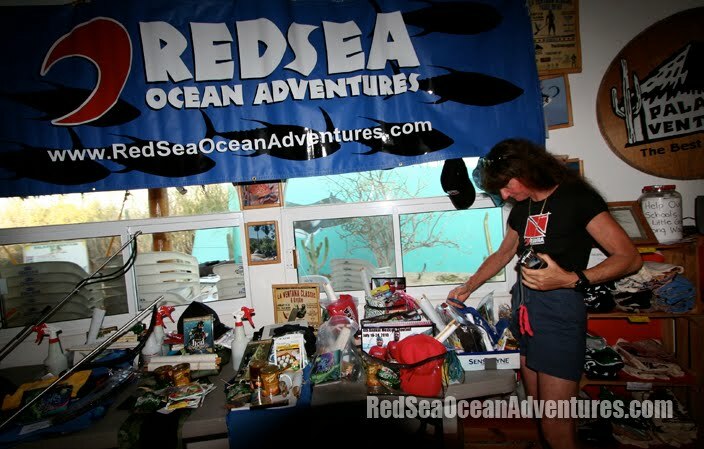 From pelagics to reef action, this place has it all! Of course my highlight of my trip was landing one of these....Stripe Marlin which put up an incredible fight. Story to follow later...Muchos Gracias to Tim, Jimena, and Karon Hatler for all their warm hospitality and we are looking forward to seeing you guys next year. Make plans to join us for the 5th annual Mexican shootout next summer. it wasn't a stone shot so my partner Travis lined up his 120 cm Euro and gave him the kill shot. So we called it our "Last Chance Mahi". Our first one this year so we were all stoked. We did a few more drops for some of our favorite fishes for sashimi and before we knew it, it was time to go! It's a long drive to the west side but glad we were able to get a few fish for the week. Today the water was a little rough as the trades were picking up so we had a couple hours to kill. Divers Owen Adams Sr.(above), Owen Jr., and Travis Masutani climbed on board and we headed to do some reef diving. We got a mixed bag of black and reds, with these nice stringer of menpachi, uhu, and jo-louis caught by Owen Sr.
After we finished washing up, we were talking story and eating lunch and this huge boat pulls up and in the bed of the truck is this giant Marlin. They just caught it and it was so big it didn't fit in their fish box of this 30 ft. boat. Quickly the crew starts cooling the fish off with the water hose so it wouldn't spoil. Then out comes Captain Ken, with a saw to cut off the bill so it would fit in their fish box. It weighed in at 425 lbs, so looks like lots of smoke marlin for this week. Let me know when I can swing by for a pick up. Ha ha! This 4th of July we decided to spend it up on the North Shore of Oahu to avoid the crowds but it was packed up there as well. There were rides for the kids, food booths for the adults, and lots and lots of people. We walked through the festivities with everyone parked on the west end near the stables hoping to get a good view. I think everyone on the North Shore was here celebrating our freedom and independence. Entertainment by Kapena Ohana was jamming the ukulele and rocking the house. We couldn't find a good spot so we headed back to the Turtle bay hotel and sat by the poolside to watch the fireworks display. We are so lucky to live in a nation that celebrates our Independence Day, and allows us the freedom to follow our hearts desire. Life is short...dream Big and just do it!